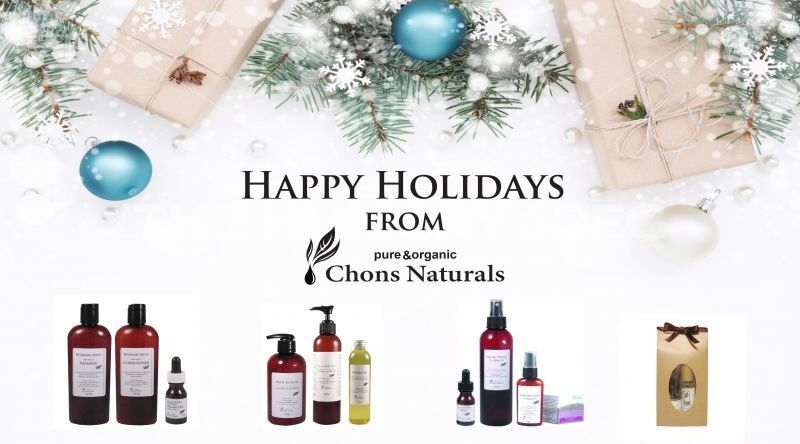 Aromatherapy and Natural Cosmetics from Canada, Chons Naturals. New!! Two products just joined our 100% natural makeup line!! Our 100% natural makeup products have been loved by our customers since its launch in 2014. And now we are very excited to announce that two new products just joined our makeup line!! Now you can choose your Tinted Moisturizer form two shades, Light and Medium!! Medium is our original shade and Light is lighter than our original shade. Medium shade is recommended for medium skin tones and Light shade is for fair to light skin tones. Our Tinted Moisturizer is enriched with Pomegranate and Rosehip Oil, rich in antioxidants and essential fatty acids to prevent skin damage and aging. Lemongrass, Lavender and Geranium Oils are also added to soothe and illuminate the skin! Translucent Illuminating Powder acts as a veil to blur fine lines and imperfections. It provides a luminous soft focus effect on the skin. Translucent Matte Powder is a lightweight powder which absorbs shine, minimizes the appearance of pores and lines. It keeps your skin smooth and polished, and enhances staying power of makeup. Both of the powders are made of 100% natural ingredients. They are translucent and designed for all skin tones. Please try them this Spring and Summer!! Starting to show visible signs of aging? Revitalize your skin with our anti-aging serum and give yourself a facial massage for brighter younger-looking skin! Multi-Nutrient Serum is a powerful anti-aging serum. It is extracted from soy beans, and it has full of vitamins and minerals which renew damaged cells and revitalize your skin. It makes your skin smooth and soft, prevents from lines and wrinkles. ■Multi-Nutrient Serum 15ml (Regular Price: $22) NOW $19!! 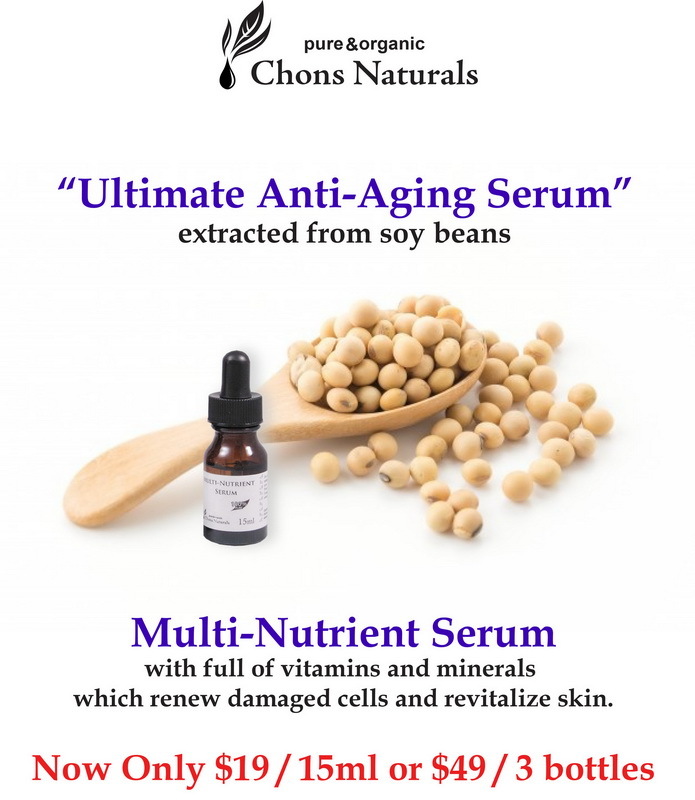 ■Multi-Nutrient Serum 15ml × 3 (Regular Price: $58) NOW $49!! Give yourself a facial massage and enjoy spa-like result at home!! Organic Shea Butter offers intense hydration and Rose Geranium Extract revitalizes and reduces the appearance of the first signs of aging. ■Nourishing Massage Cream (Regular Price: $19.50) NOW$16.50!! ■Facial Toner 240ml (Regular Price: $27) NOW$24!! Each product contains plenty of nutritious plant extracts to suit the skin types and problems. The various nutrients including Vitamins and Essential Fatty Acids soften, soothe, and nourish your skin. The offer will end on April 30th. Please don’t miss it!!! 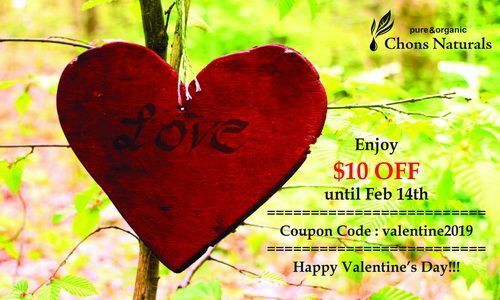 Enjoy $10 off Valentine's Day Coupon until Feb 14th!! A Valentine's Gift for You to Enjoy!! $10 off Valentine's Day Coupon is available now!! 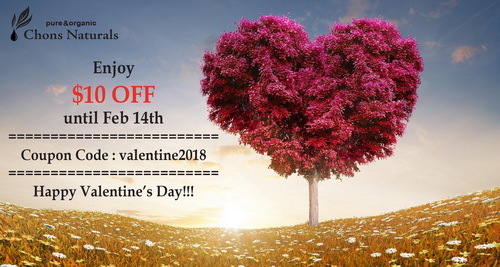 The Coupon Code is valid until Feb 14th. Limit one time per customer with any $75 purchase. Use the Coupon Code at check out. New!! Hydrating Mask for intensive hydration!! 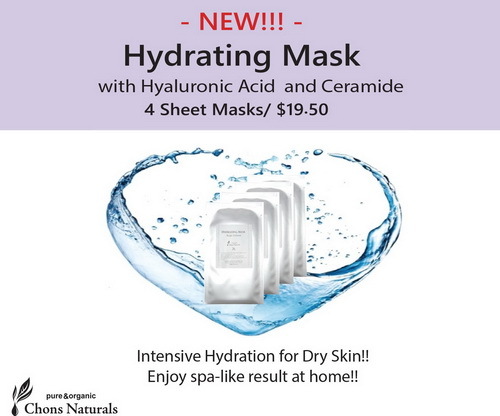 Try our new Hydrating Mask for intensive hydration!! The sheet mask is very easy to use. Place over your face and just relax, and you can experience spa-like result at home!! Hydrating Mask contains Hyaluronic Acid and Ceramide, which retain water effectively and prevent dehydration. It improves suppleness, plumps lines, prevents moisture loss and makes the skin softer and smoother. Our sheet masks are made from 100% plant derived ingredients. We wish you health and beauty, and a wonderful year filled with love and happiness! Moisturize and protect your skin from dry cold winter!! Hyaluronic Acid binds water to the skin. By using this serum after facial toner, it retains water effectively and prevents dehydration. It improves suppleness, plumps lines, prevents moisture loss and makes your skin softer and smoother. ■Hyaluronic Acid Essence 15ml (Regular Price: $22) NOW $19!! ■Hyaluronic Acid Essence Set of 3 (Regular Price: $58) NOW $49!! Our Moisture Cream is 95% Organic, and contains Rosehip Seed Oil which has various nutrients including Vitamins and Essential Fatty Acids to soften, soothe, and nourish your skin. Regular Price: $25 → NOW $22!! Our Massage Oils are 99% Organic!! All of our Massage Oils are enriched with Jojoba, Rosehip Seed oils to moisture, nourish and soften your skin. This offer will end on Feb 28th. Please don’t miss it!! 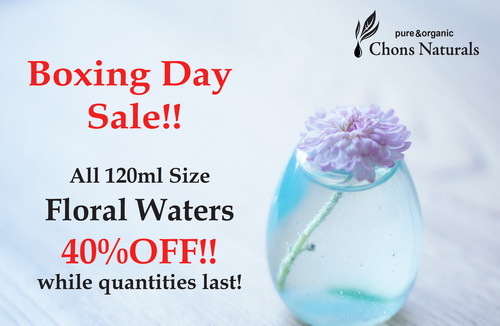 ■All 120ml size Floral Waters are 40%OFF now!! The quantity is limited, so hurry to get yours before they are gone!! Earn 5x points until Dec 25th!! It means, if you make a purchase now, you will get 5% back to use towards your next purchase!!! ▼Any customers who are registered with us are able to earn points on every purchase. ▼Registration is absolutely free with no annual fees. ▼You will earn 5 points every $1 purchase now. ▼You can redeem every 100 points for $1 discount towards your next purchase. This offer will end on Dec 25th. Earn points and enjoy your savings!! Holiday Special Packages are now available!! We picked popular items and created 11 kinds of gift sets. Great gift ideas for your family, friends, and yourself too!!! Please don't miss this special deal!! This is a limited time offer until Dec 31st. Come to see us @ Whole Life Expo on Nov 9-11th!! 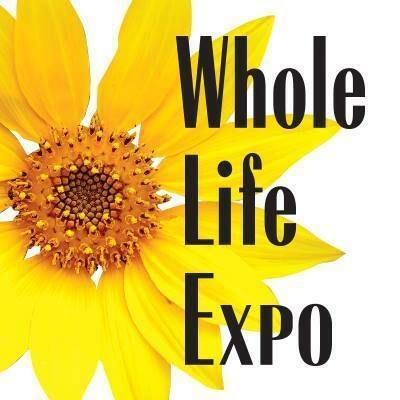 We will be at Whole Life Expo on Nov 9-11th!! Whole Life Expo is Canada's largest showcase of natural health, alternative medicine, and green living. Over 200 dynamic exhibits feature the latest in natural health and green living products, services and research. This is the second year for us as an exhibitor and very excited to be a part of this show again! At our booth, Chons Naturals Hair Care Products, Essential Oil Blends/Roll-on Remedies and Facial Serums will be available. If you are interested in natural living lifestyle, this would be a very exciting event for you! Please come to see us. Your friends and family are welcome too!! Protect your face and body from dry air with our natural moisturizing products!! Our nutritious organic Argan Oil and shea butter enriched Body Lotion are on sale! Take advantage of this opportunity and enjoy treating your skin! ■Cleansing Cream 240g (Regular Price: $32) NOW $28!! Our Cleansing Cream removes impurities and make ups very well, but leaves moisture the skin needs. Rosehip Seed oil, which has various nutrients including Vitamins and Essential Fatty Acids soften, soothe, and nourish your skin, while essential oils of Lavender and Rosemary balance and refresh your skin. ■Argan Oil (Extra Virgin) 50ml (Regular Price: $18.50) NOW $16.50!! Rich in Vitamins and essential fatty acids, Argan oil moisturizes dry skin and nourishes aging skin. Argan oil also makes hair stronger and healthier. ■Vitamin E Essence 15ml (Regular Price: $13) NOW$11.50!! Vitamin E is a powerful antioxidant. It renews damaged cells, and helps acne scars and dryness. Our Body Lotions are 100% Natural and 94% Organic!! Enjoy treating your body with your favorite scent! The offer will end on Nov 15th. Please don’t miss it!!! 10%OFF Anniversary Sale until Sep 30th !! Chons Inc. was born 11 years ago today! 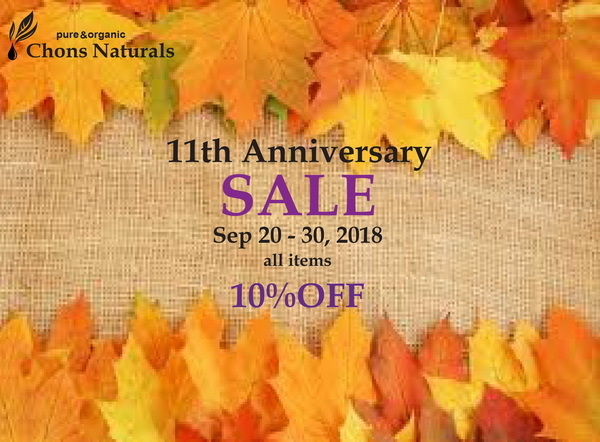 Please celebrate the 11th Anniversary with us and enjoy 10% OFF on all items!! The Coupon Code is valid until Sep 30th. The sale is 10 days only! Take advantage of this opportunity and enjoy your savings! Limited time offer until Sep 19th!! Have you tried our Shampoo & Conditioner? If not, this is a good chance to enjoy treating your hair and scalp naturally!! Our Shampoo & Conditioner are 100% Plant Derived and Biodegradable, SLS Free, Silicon Free, and Paraben Free. ■All Shampoo & Conditioner in 240ml size (Regular Price: $13.50) NOW $11.50!! ■All Shampoo & Conditioner in 480ml size (Regular Price: $20.50) NOW $17.50!! Our organic oil blends let you enjoy the benefits of aromatherapy with ease. Just pick one of five types to match your mood and enjoy! 5 types 10ml (Regular Price: $12.50) NOW $10.50!! 5 types 10ml (Regular Price: $14.50) NOW $12.50!! Don't miss this opportunity! This sale will end on Sep 19th! It's a nice season with a lot of sunshine! However, sunshine is not always good for your skin. Sun exposure can cause premature aging including wrinkles, dryness, freckles and dark spots. Try to avoid direct sunlight in the day time and take care of your skin with active Vitamin C at night time. Our Vitamin C Essence and Whitening Mask will help you to have brighter and younger-looking skin!! "Intensive Skin Care for Aging Spots, Freckles, Acne Scars and Open Pores"
Vitamin C delivers active protection against aging caused by sun exposure. It effectively reduces dark spots, evens skin tone, and increases collagen and elastin production. Recommended to use every night. Each mask contains 28g of active ingredients including α-arbutin and Vitamin C derivatives. Recommended to use once a week. ■Cleansing Gel 240ml $27 → NOW $24.50!! Cleansing Gel removes impurities and makeup effectively, including SPF creams and waterproof eye makeup. Formulated with all natural ingredients, it is gentle to the skin and cleans without stripping the skin of essential moisture. Enriched with essential oils of Grapefruit and Tangerine, it leaves skin perfectly clean, fresh and soft. Our Natural Cleansing Gel is 100% Natural and made with Organic Oils and Plant Extracts. ■Lavender & Geranium -Relaxing- Hand & Body Wash $14.50 → NOW $11.50!! ■Orange & Bergamot -Uplifting- Hand & Body Wash $14.50 → NOW $11.50!! ■Eucalyptus & Tea Tree -Refreshing- Hand & Body Wash $14.50 → NOW $11.50!! ■Ylang Ylang & Sandalwood -Energizing- Hand & Body Wash $14.50 → NOW $11.50!! ■Chamomile for Baby -Hypoallergenic- Hand & Body Wash $16.50 → NOW $13.50!! ■Rose -Rejuvenating- Hand & Body Wash $19.50 → NOW $16.50!! Our soaps are 100% natural and biodegradable, made with organic plant oils and extracts, and does not contain any mineral /animal oils, synthetic chemicals, or SLS. The offer will end on August 31st. Please don’t miss it!!! Come to see us @ J-TOWN side-walk sale on May 27th (Sun) !! We will be at J-TOWN side-walk sale on May 27th (Sun)!!! We will have a booth at J-TOWN side-walk sale this Sunday!! This is the first J-Town event we will join this year. Please come to see us and try all of the samples!! Your friends and family are welcome too!! We look forward to seeing everybody there!! May & June Special !!! UV rays are getting stronger!! Don't forget to protect your skin with sunscreens before you go out! 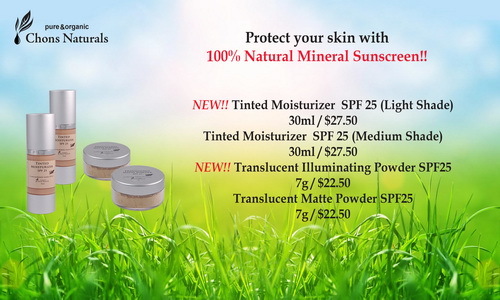 ■Tinted Moisturizer SPF25 30ml (Regular Price:$27.50) NOW $24.50!! ■Translucent Matte Powder SPF25 7g (Regular Price:$22.50) NOW $19.50!! Our Tinted Moisturizer and Translucent Matte Powder are made of 100% natural ingredients so that you can prevent UV rays in the safe way instead of using high SPF lotions with strong chemicals. We believe using natural products with lower (20 to 30) SPF every 2 to 3 hours is the best way to protect your skin. No need to damage your skin from chemicals to prevent UV rays!! Collagen Essence improves your skin's strength and elasticity, and make your skin firm and resilient. One of the most popular items in our store! This organic eye cream soothes and revitalizes the delicate eye area and prevents from wrinkles. This offer will end on June 30th. (60min) Regular $89 →Special Price $79!! 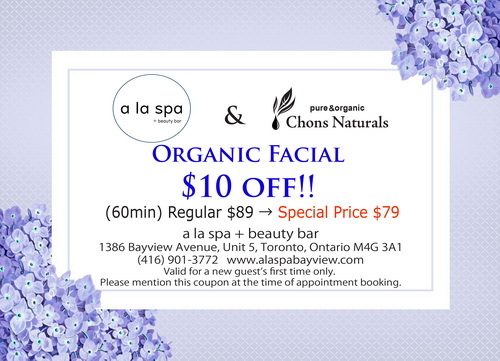 We are very excited to announce that “a la spa + beauty bar” is now offering Organic Facial using Chons Naturals products!! This facial is recommended for all skin types including very sensitive skin. Experienced esthetician, Ayako Takada will customize the treatment to meet your specific needs and make your skin vibrant and revitalized. Please mention this offer at the time of appointment booking. Valid for a new guest’s first time only. Director of Chons Inc. Chika Matsuo was interviewed by TORJA Magazine 2018 March issue, featuring beauty industry in Toronto. NEW!! 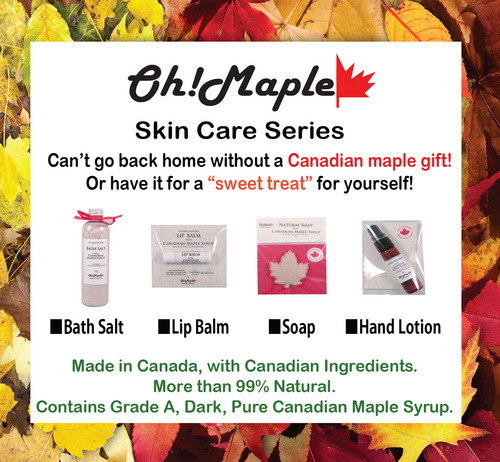 Oh!Maple Skin Care Series for a sweet souvenir! Can’t go back home without a Canadian maple gift! Or have it for a “sweet treat” for yourself! Try our new Skin Care Series made with Pure Canadian Maple Syrup!! Made in Canada, with Canadian Ingredients. Contain Grade A, Dark, Pure Canadian Maple Syrup. ☆37 times more calcium than honey! ☆20 times more magnesium than honey! ☆17 times more potassium than honey! ☆over 60 types of polyphenol included, anti-inflammatory effects and great for stress relief! give yourself a facial massage for brighter younger-looking skin! which renew damaged cells and revitalize your skin. ■Multi-Nutrient Serum 15ml (Regular Price: $22) NOW $18!! ■Multi-Nutrient Serum 15ml × 3 (Regular Price: $58) NOW $48!! revitalizes and reduces the appearance of the first signs of aging. clear out the lymph cells of the toxic fatty deposits, which cause cellulite. Enriched with Jojoba and Sweet Almond oils to moisture, smooth and soften your skin. ■Detox Massage Oil -Anti-Cellulite- (Regular Price: $21) NOW $16.50! !